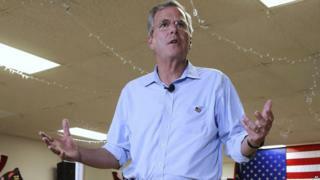 During a visit to New Hampshire on Wednesday, Jeb Bush was asked about his plans for tax reform. Mixed in with talk about an ambitious goal of 4% US economic growth was a bit of advice that left the Republican presidential candidate scrambling to explain himself. "We have to be a lot more productive, workforce participation has to rise from its all-time modern lows," Mr Bush told the editors of the New Hampshire Union Leader in an interview that was broadcast online. "It means that people need to work longer hours and, through their productivity, gain more income for their families. That's the only way we're going to get out of this rut that we're in." It didn't take long for the rapid-response teams of Mr Bush's political adversaries - on the left and the right - to spring to action. The Democratic Party released a statement calling Bush's "work longer hours" line "easily one of the most out-of-touch comments we've heard so far this cycle". "Anyone who believes Americans aren't working hard enough hasn't met enough American workers," tweeted Democratic presidential candidate Hillary Clinton, along with a chart showing increases in worker productivity hasn't been matched by a rise in hourly compensation. Rick Tyler, a spokesperson for Republican presidential hopeful Ted Cruz, was more direct, warning that Mr Bush's comments could brand the former Florida governor with the same "out of touch" label that dogged 2012 Republican nominee Mitt Romney. "The problem is not that Americans aren't working hard enough," Tyler said. "It is that the Washington cartel of career politicians, special interests and lobbyists have rigged the game against them." Jeb Bush's remarks also harken back to a controversial comment made by his brother, George W Bush, in January 2005. "You work three jobs?" then-President Bush asked a divorced mother of three in Nebraska during a town hall forum. "Uniquely American, isn't it? I mean, that is fantastic that you're doing that. Get any sleep?" Later on Wednesday Jeb Bush clarified his remarks, saying that he was referring to Americans who are looking for full-time work but are unable to find it. "Only Washington Democrats could be out-of-touch enough to criticise giving more Americans the ability to work, earn a paycheque, and make ends meet," a Bush campaign aide said. Image caption In 2005 George W Bush told a woman that working three jobs was "uniquely American"
The Protestant work ethic - that labour not only leads to prosperity but also personal salvation - has been ingrained in US culture since the days of the Pilgrims, of course. And when compared to other industrialised nations, Americans log some of the longest hours, according to the Organisation for Economic Co-operation and Development. In 2014 US workers clocked 1,789 hours of labour per year, behind nations like top-ranked Mexico (2,228), Russia (1,985) and Hungary (1,858) but ahead of Japan (1,729), Canada (1,704), the UK (1,677) and Germany (1,371). In 2014 Gallup conducted a survey of Americans that found full-time workers averaged 47 hours per week and 18% worked more than 60 hours a week. Americans also tend to take fewer holidays than their European counterparts, a phenomenon the US Travel Association's Project: Time Off labels the "work martyr syndrome". According to the Bureau of Labor Statistics, in 2014 US workers averaged 16 allotted days of vacation, although there is no statutory requirement that businesses give their employees any time off whatsoever. A Glassdoor Employee Satisfaction survey found only 25% of US workers took all the time off they were given, however, while 15% take no took no vacation at all. In 2013 the Center for Economic Policy Research looked at guaranteed vacation days in other Western nations. France led the way with 30, followed by the UK at 28. Germany, Belgium Australia and Switzerland all mandate 20 days off, not including paid national holidays. So although he put it rather inelegantly, Mr Bush is right - many Americans are working fewer hours than they would like. And, if given the choice, chances are they'd end up working a lot more hours than anyone else in the world - with fewer holidays along the way. Are you one of those Americans who works longer hours with fewer breaks? Or a European who enjoys all those government-mandated vacation days? Let us know in the comment section below. What length should summer holidays be?